There are so many unsolved (as yet) "why's" in this tragedy. By the way, would somebody explain to me why those two corridors were decided upon as the possible routes, i.e. so diametrically opposed? I'm assuming it was because of the position and/or timing of the satellite information, but I'd like to understand the "how" of it. Thanks. Make it as technical as you like. I could not make it sound technical if i tried! Basically i think they measured the time it took the planes response ping to reach the satellite, obviously if the ping's were coming back faster, that would mean the plane is getting nearer to the satellite, time would equal out whilst the plane past at it's closest point, then increase once the plane had past. Because they knew where the plane was last reported, they could distinguish in which direction the plane was travelling. I think the satellite was in a stationary orbit somewhere above the Indian Ocean (not sure on that though), So, from the last known position of the plane they could work out from the timing of the response just how far from the satellite the plane was when it gave the fastest response - once the plane had passed the satellite the response time would start to increase. So, at the shortest response time, they could work out the planes distance as it passed by. (They would do lots of maths to get a distance - speed of transmission signals etc). From that they would know that the plane passed by the satellite at a rough distance away.Then, once the plane had passed, they would compare the difference in response time between the plane approaching the satellite, to the response time after it had passed by, from that they could determine the angle at which it passed the satellite. BUT, to start with they did not know what side of the satellite the plane was passing, all they knew was that it had to be passing by at a set distance from one side or the other, and at a set angle, either to the north or south. The really clever bit is how they managed to determine which side it passed by on, they mentioned at this morning press conference that it was achieved by using the Doppler effect (and lots more sums no doubt). But don't ask me to explain that part of it - i do not have a clue. I think i have got all of that more or less right, i am sure someone will correct me if i am wrong. BBC World News had a very good explanation of this just now. Basically, the first estimates were based on the coverage Area of the Indian Ocean Inmarsat satellite, known as its foot print. What the first detected was only that the plane was at the outer edge of the Eastern coverage area, but not whether it was moving North or South. This cave the curved "corridors", while the plane was likely to fly in a strait line on a Mercator projection map/chart. The new calculation they made was based on the Doppler effect, which can tell whether the target is moving towards or away from the listener. The "pings" were received at 07 min. and 37 min. passed each hour. Comparing this to signals from other planes flying in the area, they were able to determine the direction of travel more accurately. The latest news is that there were a "unscheduled" partial "ping" at 0819 Malaysian time, which could indicate the time when the fuel run out and power was lost. If so, that would be the time the plane started to glide towards the sea surface and eventually crashed, maybe 100 - 150 km. further along the flight path, depending on the altitude it was on. Earlier they also showed the flight path as reported after it lost communication. This indicated that the plane first turned to Stbd. 270 degr. and flew West, then turned South and eventually SW, across the Malayan Peninsula in Malaysian airspace. At the same time it was mentioned that it dropped to a lower altitude, which would be consistent with loss of cabin pressure. As an old cynic, I don't believe this is accurate and it was not repeated later. If that was the case the plane could not fly as far south as what is now believed to be the case, as it would use a lot more fuel at lower altitude. I stick to my assumptions in earlier posts above. I caught the last half of that report, very interesting, and nothing like what i said earlier! I also picked up the part about a partial ping, that little bit of info may be a big help to them, much better idea of how much further she flew down the corridor. Thank you, Steve and Ombugge for your explanations. Yes, I understand how the Doppler effect can help in a case like this, we are all familiar with it in our daily lives. But what I don't get is that right at the very beginning, before Immarsat released their findings and when the discovery was made that things had gone wrong and the plane had made that first turn, is how they suggested those two possible corridors, one roughly NNW and the other SW, if I remember correctly. After the second ping was received, surely they would have been able to decide which way it was going, north or south? Yet they kept to those two possibilities for quite a while. The two recent curves shown on TV, both approximately southwards but passing one each side of the satellite are more understandable, but that initial north/south option has puzzled me right from the start and I still don't get it. Have now found a diagram which shows those first two possible corridors as arcs of the same circle. That clarifies things more for me. The first diagrams as seen on TV merely showed two lines going in different directions that made no sense to me. The "ping" is not directional and the receiver on the satellite can only tell whether it is strong or weak. If very strong the signal come from somewhere near to vertical, if weak it is nearer to the satellite's "horizon"/edge of coverage are. Yes, I understand that. However, one of the reasons for my confusion right at the start was that I hadn't realised that the communication satellites were geostationary. I had assumed that they orbited relative to the earth, hence my non-understanding of those two original corridors. They just didn't relate to what could be "seen" by an object circling the planet. I can see where you got confused, Ivy. Yes, that satellite was in a geostationary orbit, sorry, i should have made that more clear when i first answered. This picture shows what i was trying to explain. That's how they determined the two basic corridors to start with. Graphic obviously from before they refined the data to determine the plane took the southern corridor. Yes, Steve, that's the map I found somewhere yesterday. Oh, there's no need for an apology, goodness me, what you said was a great help and there were so many factors to take into account. But once having seen those two arcs relative to the geostationery satellite it was immediately obvious how the two original corridors were mapped. Reading the account of the work that the Immarsat people had done it was fascinating how they had compared the doppler effect on the pings with the known trajectories of other aircraft doing similar flights north and south in the area, which eventually enabled them to choose the southern route as the most likely. As you'll know, the Australian Govt. have now moved and narrowed the search area further north, having obtained yet more information from radar analysis. Incredible how so much can be discovered from what seems to be relatively scant information. The plane has now been missing for three weeks and no firm findings yet. Not totally unheard of in history, but this is 2014 after all. I don't understand why they changed the search area ENTIRELY 1100 km. North East. 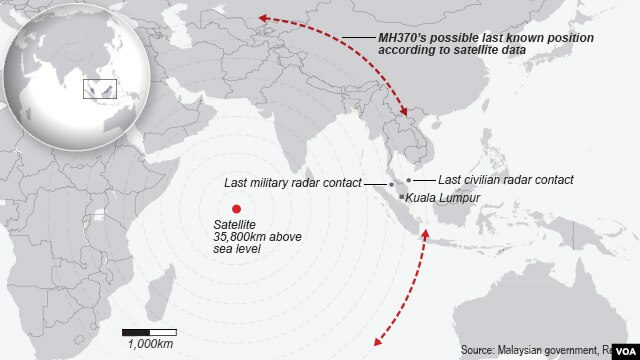 Yes, new "credible lead" was offered by re-interpreting Radar data from when it flew across the Malayan Peninsula but, with the erratic interpretations that has come from there earlier, wouldn't make more sense to look at the debris that was sighted by three different satellites and by planes in the earlier search area as well?? With 10 planes and 10 ships now available, I would not be surprised if they return there very soon. It also does not explain the last "ping" at 0811 hrs., which indicate that the plane was still flying and powered at that time, even if only battery power was available at that time. With the speed and fuel on board being known, the distance flown can be calculated and the final position approximated, allowing for wind drift at whatever altitude the plane was on. One thing that has been confirmed with these last Radar data interpretations is that the plane just made a turn and tried to get beck to KLIA or Subang, as was first assumed. It was not flying an erratic route to avoid being seen on radar, or avoid flying over Sumatra etc. The arguments for some terrorist action is thus even less credible. How they will eventually explained that the plane apparently could fly undetected across the most densely populated part of Malaysia, with the most air traffic, without anybody noticing and questioning why a plane without ID was in their air space and without communicating with the local Air Traffic Control will be interesting to see. Don't be surprised if the next correction of search area is back where they were originally, in the roaring forties. Yes the weather is better further North, but it does not make it more logical. "What are you looking for? Why are you looking here then? It is too dark over there". I agree with your thinking. Especially when i think back to the satellite images showing well over 100 small objects floating together. Certainly a debris field, but debris from what? They really should be down there finding out. I would not assume that an erratic or changing flight path is needed to elude radar. A continuous, stable path would look more "normal" to any radar that might see the aircraft. Actively zig zagging or flying erratically is something more for a military aircraft and more likely to arouse suspicion. Still, I don't think most realize how the air space is like the vast ocean, only bigger and covering the entire planet. If you are not transmitting... you can easily disappear either by accident or intent. In central USA a commercial aircraft (Southwest 4013) landed at the wrong airport. The only reason it was known was because the pilots radioed and told the controllers. The controllers had no radar visibility of the aircraft and did not know where it was until the pilots told them. The path that most aircraft fly as they cross oceans and much of the planet is out of range of radar and their location is only known because they transmit it. Disappearing is easy. Air France 447 was on it's intended flight path so there was a known, very specific line where to look. Finding wreckage took days. Recovering the data records took almost two years. I think these two accidents Air France 447 and Malaysian Airlines 370 may force a dramatic shift in aircraft tracking. Until now "we" have wanted the crew to absolute control over everything. The ability to turn anything on or off as needed in time of emergency. Maybe we shall now see a change to aircraft transmitting their location automatically and via a system that cannot be accessed by the crew. Transponders and data recorders that don't sink like stones but can float so they might be found a bit sooner. Maybe even aircraft transmitting critical data to satellites when an anomaly (problem) is detected. Previously the machine was unreliable and we needed humans to have ultimate control to save the day. As technology has improved man is proving to be the weak link. Broadcasting location and aircraft data to a satellite is easy. Will we ever decide to do away with the flight crew? A couple major accidents of first tier air carriers in the past five years were either caused by the crew or a recoverable situation that was not corrected by the crew. Then when you factor incidents like LUV 4013 that were totally human error it really makes you wonder if first class seats will someday have forward facing windows. "I would not assume that an erratic or changing flight path is needed to elude radar"
That has been the main reason given for the conspiracy theories of hijacking, terrorism and rough pilots. We already have world wide tracking overage available, if the communication satellites are used. Inmarsat received "pings" from a disabled airplane, although MAS did not subscribe to their service. If there had been a temper free system sending positions via that same antenna that was used to transmit the "hand shake", even if only every 30 min. it would have been possible to plot the likely crash site fairly accurately, allowing for drift, not just heading. ​Why is it not possible to eject the locator beacon (EPIRB) and the "Black Boxes" at impact, whether on land or at sea? As said earlier all ships are equipped with such Locators and all ships over 3000 GRT has to be equipped with a Voyage Data Recorder, similar to the "black boxes" in aircrafts. The EPIRB takes position signals from the American GPS network and send vessel ID and position to SAR Centers around the world via the Russian COSPAS communication satellite system. I have previously wondered whether the people running this SAR operation is aware of the civilian resources available in the area, especially the long liners operating in the Southern Indian Ocean? These also have one or two ROVs, capable of operating in 3-4000 m. water depth, and with trained operators already on board. She has been equipped with a "towed pinger detector" and an underwater drone from the US Navy, both of which was flown in from the States. They do basically the same as the HPR and ROVs already available in the area. The navy vessels out there may have towed hydrophone to listen for noise from Submarines. These may be tuned to pick up acoustic signals of the frequency emitted by the "black boxes". In any case, before they find debris and narrow down the search area to a few hundred Sq. N.Miles none of these sophisticated system make any difference. Even when they do it may take days/weeks/months to locate any wreckage on the seabed, especially if only one vessels with the right capability is used. I have to admit that I have paid a lot of attention to this thread the past days, and weeks. First of all, I'd like to thank the contributors to this thread for sharing their thoughts and comments. Because of current work situation, I have refrained commenting in order to "stay out of trouble". But, now, after more than 3 weeks after the disappearance, with still no single trace of the aircraft, I have to admit that I feel the frustration of the families affected. Interesting to note that the locator beacons built for today's aircraft are still only required to be built to a specification dating back to the late 1980's. Also worthy of note, after a diving accident in the North sea where two divers lost their lives due to their diving bell being lost on the sea floor, the Association of Off Shore Diving Contractors agreed that in future all diving bells should be fitted with a locator transponder, rather than the standard pinger. The transponder gave greater range, direction finding abilities, plus a battery life of 18 months between changes. Two divers lost so changes were made in the diving industry. Air France lost a plane with over two hundred on board, but still the aviation industry drags it's heels. Obviously a plane carrying a transponder locator is no safer than a plane carrying a standard pinger locator, but, in cases such as this, further similar accidents in the future may well be prevented if the black boxes of flights such as MH370 are found.